I mentioned in my post for zucchini-ricotta fritters that I had just bought The Complete Italian Vegetarian Cookbook. This cookbook has quickly become a trusted reference and recipe source for all the vegetables we've received from our CSA. My only gripe is that I'm afraid the season will be over before I have a chance to try all the recipes I have bookmarked! Every Monday, we receive an email from our farmer, giving an estimate of what produce we'll receive for the week. As tomatoes were booming, he said to let him know how many tomatoes was too many. Too many? I said bring it on! There is no such thing as "too many tomatoes," especially when they are by far the best tomatoes I've ever eaten in my life! 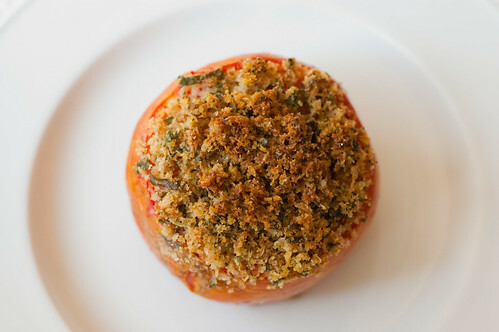 This recipe for stuffed tomatoes is certainly a good use for all those beautiful tomatoes. They are hollowed out, then stuffed with a mixture of bread crumbs, herbs, cheese, and garlic, and roasted in the oven. 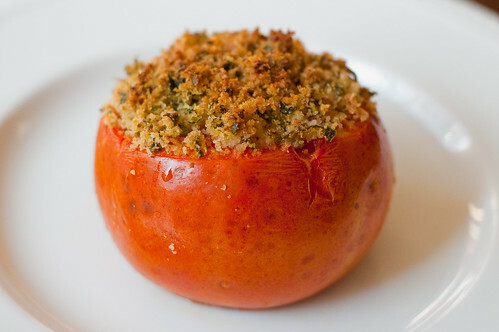 The tomatoes get nice and soft, and the breadcrumb topping is nice and crispy. I served these with a side of pesto rice and green bean salad (recipes coming soon! ), for a really nice summer meal. Preheat the oven to 375. Cut off and discard a 1/2-inch slice from the top of each tomato. Using a small spoon, scoop out and discard any remaining parts of the core, plus the seeds. Use your fingers to reach into each tomato and pull up as much liquid as you can. Be careful not to puncture the skin. Combine the breadcrumbs, cheese, herbs, garlic, wine, 3 tablespoons of oil, salt, and pepper. Stuff the tomatoes using a small spoon or your fingers, making sure that the filling reaches all the hollowed out places. Mound the filling a little above the top of each tomato and pat it gently to compact it. Lightly grease a baking dish that is just large enough to hold the tomatoes, and place the tomatoes in a single layer in the dish. Drizzle the remaining oil over the tops of the tomatoes. Bake 25-30 minutes, or until the stuffing is golden-brown and the tomatoes are soft, but not falling apart. Allow them to cool at least 15 minutes before serving. I just got an email from our CSA with the veggies we're getting this week: 5 lbs. of tomatoes were on the list! I can't wait to try this recipe. When we had lots of zucchini I made the fritters you mentioned. They were awesome so I have high hopes. Wow! These look amazing. I love how the unknown bounty of the CSA delivery can spark creativity in the kitchen. Will definately have to try this one! I have this cookbook but never feel too inclined to open it up. I'll have to give it another chance!